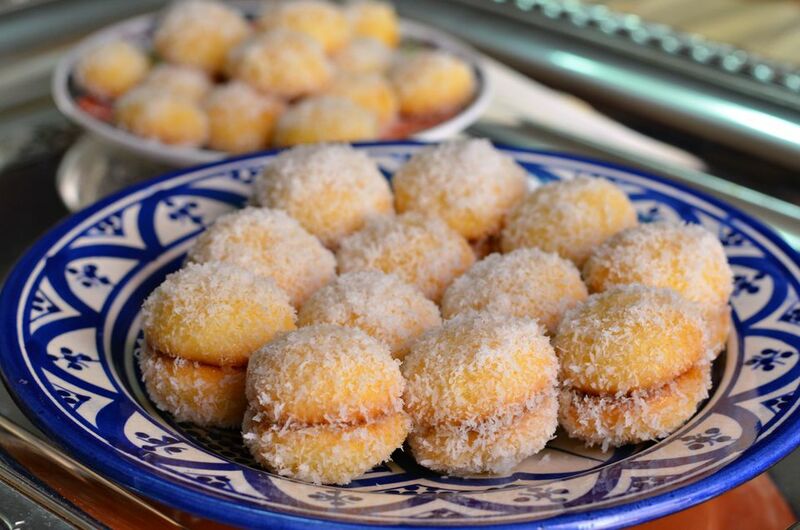 Take a look at the photo, and it's easy to see why these melt-in-your-mouth Moroccan treats are called Snowball Cookies (Boules de Neige in French and Kwirat Tlj in Moroccan Arabic). Two vanilla-flavored cookies are sandwiched together after a dip in apricot jam scented with orange flower water, and then rolled in coconut for a satisfying finishing touch. The cookies, which were particularly popular several decades ago, are known by a number of other names, among them Meshimisha, a diminutive form of apricots, and Helwat Richbond, in reference to the cookie being comparable in texture and status to the quality bedding and upholstery products manufactured by the Casablanca-based ​Richbond company. If desired, you may omit the orange flower water and/or replace the apricot jam with another flavored jam of your choice. And, although the cookies are traditionally presented as shown, you might prefer to simply garnish individual cookies without sandwiching them together, as shown in this photo. The cookies are best served the next day, after they have softened to a desirable cake-like texture. Also, try Moroccan Coconut Macaroons and Moroccan Coconut Ghoribas. 3 1/4 cups (400 g) flour, approx. Preheat your oven to 360° F (180° C). Line two or three baking sheets with parchment paper. In a large bowl, beat together the eggs, oil, sugar and vanilla until smooth and thick. Add the flour, baking powder, and salt and stir or blend with your hands just long enough to form a soft, slightly sticky dough that can be shaped into balls. If you feel the dough is too soft and sticky, you can work in a little more flour, but take care not to over mix and not to add so much flour that the dough becomes stiff rather than soft. Shape the dough into small balls the size of cherries and place them on your lined baking sheet, allowing at least an inch (2.5 cm) between cookies. Bake the cookies in batches in the middle of the preheated oven for 10 to 12 minutes, or until lightly golden. Remove to a rack to cool briefly – about 5 minutes – before garnishing. While the first batch of cookies is baking, prepare the garnish. Transfer the coconut to a pie plate or other larger, shallow dish. Set aside. If your apricot jam has pieces of fruit in it, use an immersion blender or food processor to blend the jam to a smooth consistency. Repeat the garnishing with the remaining batches of cookies, reheating the apricot syrup if necessary to keep it of thin consistency. Allow the cookies to cool completely before transferring them to an airtight container. Cut up the parchment paper from your baking to use between layers of cookies in the storage container. For best flavor and texture, allow the cookies to rest overnight before serving or freezing. They will keep at room temperature for several days.